Kuantan is famous for its beaches and nice food which is located in the state of Pahang, Malaysia. For those who want to visit Kuantan can enjoy the beauty of Kuantan and there are many resorts nearby the city available for a stay. Bus from Singapore to Kuantan is one of the popular routes in Malaysia and Singapore, as it is a convenient mode of transportation. 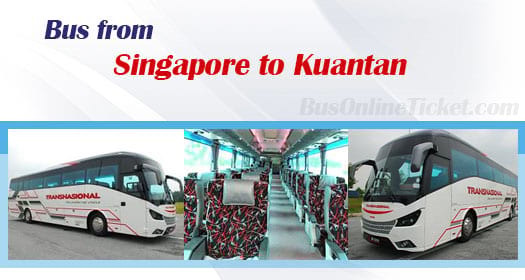 Passengers who are planning to take bus from Singapore to Kuantan can book your online bus ticket at BusOnlineTicket.com. Transnasional bus is the one and only bus operator offering bus from Singapore to Kuantan. Transnasional bus only provides 3 daily departures from Singapore to Kuantan. The bus is furnished with comfortable seats and air conditioning system. The first Singapore to Kuantan bus starts early in the morning at 9.00am and the last bus is at 10.00pm. The journey for Singapore to Kuantan bus takes around 6 hours 50 minutes. The arrival time depends on the road traffic and weather condition on the departure day. The operator is serving the route with Club Class coach in order to bring comfort to passengers during the long hour journey. Please note that in Malaysia there is no bus with toilet on board. Since Singapore to Kuantan bus is a long journey, there will be one stopover for washroom break provided along the highway. The passengers can also request for additional washroom break from the driver during the journey. The Transnasional bus ticket price from Singapore to Kuantan costs reasonably at SGD 33.90. Comparing to the flight fare, coach fare for Singapore to Kuantan bus is always much economical. The pick-up point for bus from Singapore to Kuantan is located at The Plaza @ Beach Road. Upon reaching Kuantan, the bus will terminate at Kuantan Sentral Bus Terminal. Singapore to Kuantan bus schedule is limited, so passengers are advised to book online bus ticket from Singapore to Kuantan in advance via online ticketing portal BusOnlineTicket.com. BusOnlineTicket.com is an online bus ticket portal that allows you to purchase your Trasnasional bus ticket from Singapore to Kuantan at any time and from any where. Booking your Transnasional bus tickets online is also time-saving. You can make your payment securely via online payment gateway.